Nice keyboard but I have like no experience. Might be a unpopular opinion but I can't stand load mechanical keyboards. This one feels great and is quiet. Not a bad Budget friendly keyboard for gaming. 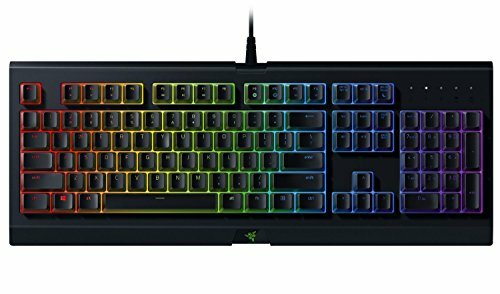 Just hate the new Razer Synapse 3.0. It's great for replacing a non-backlit, non-gaming keyboard, and it's at a pretty good price too! Well... It's a keyboard. Not great, but not bad. Keys felt a bit too stiff and kind of creaky. A bit cheap. However, I gotta say the lighting is fantastic -- it kind of looks like you're pushing keys into a colored goo or fog, so neat! Just too bad that there's a need to install all of Razers software to change from default rainbow mode... Seems it could have been optimized a bit better... The software was a big enough PITA and felt unneccessary when looking at keyboard shortcuts offered by other boards... Totally subjective stuff... At any rate, I ended up returning the board.